Suitable for those seeking a relaxing stay in a comfortable and intimate setting, with the opportunity to visit interesting towns such as Alberobello, Ostuni and Polignano a Mare a few kilometers away from the Hotel. 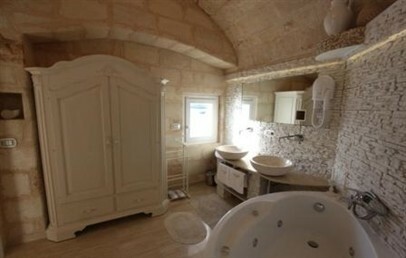 Charming hotel in the historical center of Monopoli, nestled in the ancient walls surrounding the medieval town center. 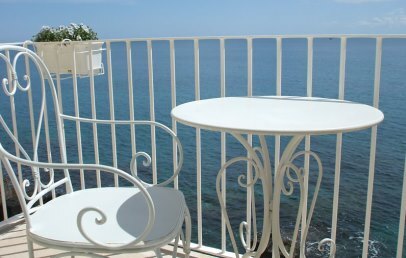 The Bellavista Suite Charming B&B overlooks the sea and offers beautiful views of the Adriatic coast. Dating back to 1500 and built inside the ancient walls surrounding the old town, the building was purchased in 1944 by the spouses Perricci-Di Mola. It was then inherited in 2006 by Roberto Perricci that, after extensive renovation, turned it into a luxurious and intimate retreat to accommodate the most demanding guests visiting Monopoli. À distinctive feature of Bellavista Suite Charming B&B is a hospitality concept that combines the elegance and sophistication of luxury hotels with the simplicity and the warm welcome of the little bed and breakfast. The modern style blends harmoniously with the traditional one and the technology is perfectly combined with the local crafts. Pastel colors evoke the blue of the sea and reflect the vibrancy of the sun that shines over the city. They are spacious and comfortable; the style is intertwined with the comfort and hospitality. The Bellavista Suite Charming B&B offers elegant suites with pearly marble floors, stone walls and white Venetian plaster, original stone barrel vault dating back to the '500. The suites are equipped with modern comforts such as Memory king-size mattresses and free Wi-Fi connection. They overlook the old town or the sea and have access to the rooftop terrace, where guests can relax in the Jacuzzi with chromo therapy and aromatherapy. The most exclusive Suite is the Suite Luxury, that feature an inner private pool. The breakfast service is offered in the room or on the lovely rooftop terrace overlooking the sea. The Mediterranean diet is the protagonist: excellent fresh products are served evrry day, including many specialties from Apulian tradition. The rooftop terrace is always at guests' disposal. They can relax in the canopy bed or enjoy the Jacuzzi with chromotherapy and aromatherapy. Upon request and with extra charge, the Bellavista Suite Charming B&B is happy to arrange an aperitif on the terrace, celebrations of birthdays or anniversaries, excursions and various kinds of car and bike rentals. The tourist tax is Euro 1,00 per person per day and has to be paid on spot. Children aged over 16 years are welcome. Suite with round 5 sq.m. 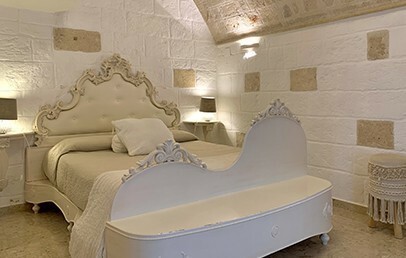 mattress king-size with memory foam, pearly marble floors, stone walls and white Venetian plaster, original stone barrel vault dating back to the '500. 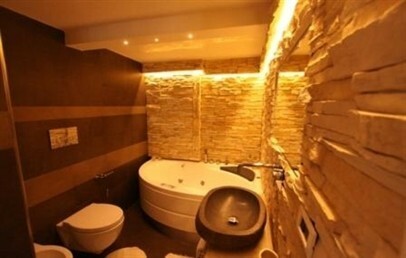 The bathroom has 1 stone washbasin and a whirlpool Jacuzzi. The Suite has a window overlooking the sea and has direct access to the panoramic terrace. Suite with bed with memory foam mattress, pearly marble floors, stone walls and white Venetian plaster, original stone barrel vault dating back to the '500. The bathroom has 1 stone washbasin and a whirlpool Jacuzzi with chromo therapy. The Superior Suite has a balcony overlooking the old town and access to the panoramic terrace. Suite with bed with memory foam mattress, pearly marble floors, stone walls and white Venetian plaster, original stone barrel vault dating back to the '500. The bathroom has 2 stone washbasins and a whirlpool Jacuzzi. The King Suite has a balcony overlooking the sea and access to the panoramic terrace. 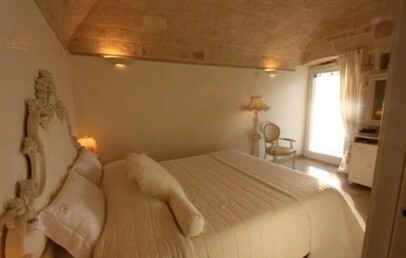 The most exclusive Suite of the hotel, located just 2 meters from the sea in a sixteenth-century fortress. The private bathroom has a shower and complimentary toiletries. The special feature of this room is the indoor 12 sq.m. pool with whirlpool, counter-current swimming function and chromotherapy. In the Suite Luxury children aged 16 years and over are welcome.